New! Gillette Fusion Proglide. Gillette's best shave, even if you shave every day. Fusion ProGlide's breakthrough blade technology helps deliver Gillette's most comfortable shave ever in manual and battery powered. Its thinner, finer blades provide significantly less tug and pull and effortless glide. Not only is the new Gillette® Fusion® ProGlide Power™ our most comfortable shave, it also turns shaving into gliding. Re-engineered to reduce annoying tug and pull, the Fusion ProGlide's razor blades are thinner than Fusion blades and feature an advanced, low-resistance coating to cut through hair with an effortless glide. Delivers soothing micro-pulses for incredible comfort. When the power turns on, the razor moves so effortlessly, you'll barely feel the blades. The razor handle features an on-board microchip that provides consistent power, shave after shave. A Low-Battery Indicator Light signals when to change the AAA battery, so you always have power when you need it. Automatic Shut-Off turns off the razor after eight minutes in case of accidental activation, and protects the battery during travel. What makes Gillette Fusion® ProGlide Power™ better than Gillette® Fusion® Power? What makes Fusion ProGlide Power better than Fusion Power is technological innovation. The razor has been reengineered and redesigned to create Gillette's Most Comfortable Shave. 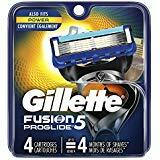 Gillette Fusion ProGlide Power shares the same core technology as Gillette Fusion ProGlide: thinner, finer blades, a low resistance coating and the redesigned Precision Trimmer Blade. - The redesigned handle now has larger, more ergonomic grips for better control. How does the Gillette Fusion ProGlide Power™ handle compare with the Gillette® Fusion® Power handle? What is the microchip and how does it work? A battery-powered razor delivers an optimal shave when the voltage and frequency remain consistent shave after shave. Over the lifetime of the battery, the voltage can weaken, reducing frequency and therefore performance. The microchip maintains constant voltage and frequency over the lifetime of the battery, delivering consistent product performance every time you shave. When a battery reaches a certain level, the oscillation frequency declines and the system is no longer capable of delivering the optimal shave. The microchip inside Gillette Fusion ProGlide Power™ senses when the battery is approaching this level. When this happens, the Low-Battery Indicator Light begins to flash, signaling that it's time to change the AAA battery. What is the Automatic Shut-Off feature? The Automatic Shut-Off feature turns the razor off after roughly 8 minutes of continuous operation. This feature protects the battery if the razor is accidentally activated, especially when traveling. With battery-powered razors, Gillette opened a new chapter in wet shaving. The addition of oscillation to Gillette wet shaving systems delivers soothing micropulses with comfort so incredible; you'll barely feel the blades. Fusion ProGlide Power™ is Gillette's most comfortable shave. For best results, should the power be turned on or off when using the Precision Trimmer Blade? The Precision Trimmer Blade can be used with the power turned on or off. Preference varies from person to person. Using the Precision Trimmer Blade with or without power is an individual choice. What type of battery does Gillette Fusion ProGlide Power™ use? How long does it last? Gillette Fusion ProGlide Power utilizes a AAA battery. With the Low-Battery Indicator Light, Gillette Fusion ProGlide Power will let you know when it's time to change the battery. Assuming average shaving, the battery should last approximately 3-6 months. Is it safe to shave with Gillette Fusion ProGlide Power™ in the shower? Yes. Gillette Fusion Power is watertight and totally safe to use in wet environments. Can I get electrocuted if Gillette Fusion ProGlide Power™ is submerged in water? No. Gillette Fusion ProGlide Power is safe to use in water. How long will the Gillette Fusion ProGlide Power™ cartridge last? How long a razor cartridge lasts varies from person to person, as it is dependent on many variables such as beard toughness and thickness, beard preparation, shaving habits, and skin sensitivity. 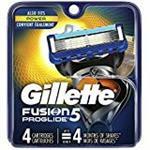 Will the Gillette Fusion ProGlide Power™ cartridge fit any other razors on the market? What is the best way to avoid razor burn? If the skin is not properly prepared before shaving or if the blade on your razor is dull, you are more likely to end up with razor burn. Make sure to hydrate hair in warm water for up to three minutes and apply plenty of shave gel. Also, be sure to change the blade on your razor at the first sign of dullness or discomfort. Is it okay to let my girlfriend or wife borrow my men?s razor? How do I avoid nicks and cuts, particularly above my upper lip? The area above the upper lip is tricky for many men. To help avoid nicks and cuts, always leave it for last. Apply plenty of shave gel and allow this area to soak up as much lather as possible. When shaving, don't apply too much pressure. Gillette® Fusion® ProGlide's™ Precision Trimmer is really useful when shaving under the nose.